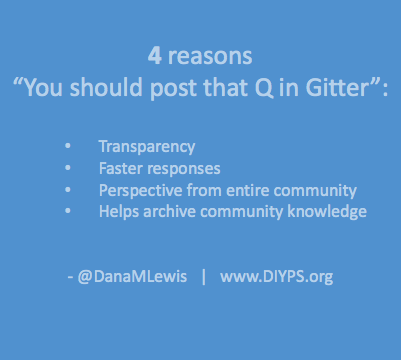 I realize it’s not always obvious to those who are newer to #WeAreNotWaiting or #OpenAPS why I am often pointing people to ask their questions in Gitter. Gitter connects with Github, so you can use the same username to log in and ask a question. And very importantly, it’s public, so *anyone* can see the conversations in channel – even if you decide not to log in. See for yourself – click here to view the chat channel. This is very key for an open source project: anyone can jump in and check things out. It also means that questions can be asked – and answered – openly, so that when someone has the same question, they can often find an existing answer with a little bit of searching. There’s another key reason why asking a question in an open channel is helpful for Q&A. Two words: time zones. There are now (n=1)*104+ people around the world with DIY closed loops, and a lot of them pay it forward and provide guidance and also help answer questions. If you send one individual a question in a private channel, you have to cross your fingers and hope they’re a) awake b) not working and c) otherwise available to respond. But if you ask your question openly in a public channel, anyone out of the large community with the answer can jump in and answer more quickly. Given that we have a worldwide community and people across many time zones, this means faster answers and more “ah-ha’s” as people collaboratively work through new and already-documented-sticky-points in the build process. So if you ask an individual a question in a private channel, you might get a “You should ask that in Gitter!” response. And this is why. You’re welcome as always to ping me across any channel, but often when there’s a good question, I’m going to want you to re-post in Gitter, anyway, so people can benefit from having the knowledge (including any answers from the community) archived for the next person who has the same or similar question.